Overtourism as a potential reputation and competitiveness issue for cities and destinations was the topic for our expert panel last September. Overtourism – linked to destination overcrowding and tourism fatigue among residents – has dominated headlines in city destinations such as Barcelona, Amsterdam, Palma de Mallorca and Venice for some time now. To what extent does “overtourism” pose a threat to the competitiveness and reputation of places? How can strategic place branding help to overcome this issue? Tip: The Sustainability Leaders Project asked its expert panel of leading sustainable tourism professionals a very similar question. The answers, available here, complement the reflections and suggestions offered by place brand developers, managers, advisors and researchers presented here. The most commonly shared concern by our panel members was that overtourism affects negatively the life quality of local residents. This may lead to the local population’s frustration and “tourismophobia” in the shape of organized resistance. Buck Song KOH warns that if locals suffer from tourism and show negative attitudes towards visitors because of their annoyance, tourism in the place will not last long. Resentment in the residents ultimately affects the way they interact with tourists and it will successively lead to a worse visitor experience. According to Sebastian Zenker, “residents often perceive urban tourism in their neighbourhood as overtourism (…), this might negatively influence the tourism of the place, since the friendliness and hospitality of the local people are an important factor of the touristic experience.” Paradoxically, then, both residents and visitors may become losers because of uncontrolled tourist flows. Similarly, a quarter of the respondents stated that overtourism reduces the quality of a place, harms the place product and, consequently, decreases its reputation. This, on the other hand, takes away the authenticity of a place and has a strong impact on its identity. For example, Sonya Hanna mentioned that the “overconsumption” of a place’s experiential attributes will lead to the erosion of its uniqueness. Put in other words, tourism will end up suffering from its own success. Todd Mayfield explains that overtourism represents a very high probability of homogenizing place experiences, which become more and more similar across destinations. Four respondents pointed out that the decreasing reputation of a place will probably have negative impacts on its attractiveness and competitiveness. “What a place gains with tourism, it might be losing in other industries, which may be a threat to the competitiveness of a place,” said Joao Freire. Gregory Pomerantsev agrees, holding that the overwhelming popularity of a destination is likely to become the downfall of its reputation and competitiveness in comparison to other destinations or cities as whole – as a place to study, work or invest. “The flow of tourists ruins the sustainability of the city life,” claims Irina Shafranskaya. Similarly, rising prices of housing, deterioration of services and stressed traffic and infrastructures were mentioned by several respondents, as these are the everyday situations that gradually lead to the decrease of life quality and frustration of residents, making the sustainability of tourism questionable. Caio Esteves, on the other hand, underlines that among the most visible negative impacts of excessive tourism are rent price rise and threats to historical heritage and the natural environment. 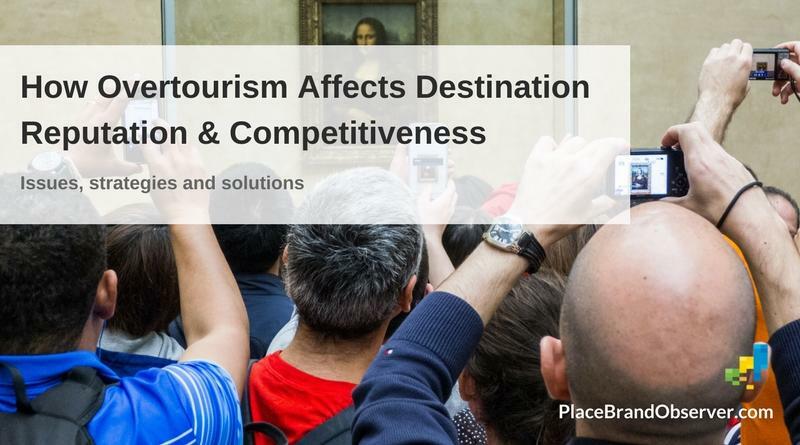 How can strategic place branding help to avoid overtourism? Both to foresee residents’ frustration and to offer a possible solution to it, many members of our research panel underlined the importance of involving residents in the process of place branding. Place branding should be conceived together with the locals and home ground should be included in the direct and indirect benefits of tourism, suggests Buck Song KOH. Caio Esteves holds that collaboration and engagement of the local population is fundamental to maintain the understanding that tourism is prosperous for everybody, not only for entrepreneurs involved in the sector. Lastly, Todd Mayfield recommends place brand professionals to put cultural research at the front of their initiative: to “dig deep and engage with local folks who live their culture”. As a technical solution to tourism overflow and its effects on the infrastructure and livability of places, several experts advise implementing stricter regulation and policies. These include permits, price discrimination, availability (opening hours) and loyalty programs. Manolis Psarros suggests that better estimations of tourist flow and distribution could be done using big data analysis. He also advises revising the current legal framework to ensure fair taxation, consumer protection and affordable housing for the locals. Tom Buncle even mentions investment freezes as a control mechanism that could help fight overtourism and put residents’ interests first. However unpopular these measures may prove to be among business stakeholders, “governments, local authorities, NTOs and DMOs need to give serious thought to applying these judiciously,” says Buncle, if we really want to protect tourism from itself. Ed Burghard holds that comprehensive place branding strategies can help address risks entailed by tourism. Strategic place branding allows creating an integrated set of choices that establish a thoughtful blueprint for managing the community brand promise over time. The most frequently mentioned approaches within these strategies are well designed segmentation, diversification and redistribution of tourist flows. Christopher Hire says that more structured segmentation of tourists and local attractions could be used to direct tourism better. Others suggest seeking for tourists that appreciate core values and wish to respect them. Tourists are always hungry for “what locals know” tips. Smart marketers can leverage that curiosity. Give people reasons to travel beyond the well-beaten path. It must be said, though, that many of these experts admit that mere redistribution and the promotion of new place attractions is probably not a long-term solution for overtourism, as long as the volume of inbound tourism remains the same. For this reason, José Fernández Cavia underlines that creating a city- or region-wide place management strategy that is not biased by tourism and short-term plans is fundamental to maintain the balance between different sectors of the local economy. Two of our experts propose de-marketing as a means of lessening the number of visitors and the pressure on local infrastructures, real estate prices and services. Heather Skinner holds that de-marketing strategies can shrink demand and discourage either the total level of consumption or the level of consumption by certain groups of consumers. Cecilia Pasquinelli suggests that “the destination brand has to work as an educational platform for both visitors and residents, making them all aware of the opportunity and need to further learn about the place they live in or visit. Gregory Pomerantsev also believes that educating tourists about appropriate attitudes and behavior is a useful tool for avoiding residents’ frustration. The implementation of this measure has been visible during the last years on the streets of Barcelona, where city-managed advertisements call the tourist to maintain silence during late hours and not consume alcoholic beverages on the streets. Finally, it must be mentioned that some experts do not think that overtourism is necessarily a global phenomenon and that it should therefore be addressed through regulations at the local level. On the other hand, Robert Govers challenges the concept of destination branding altogether. According to him “‘destination’ implies a tourism focus and the idea that places should put their brands in the hands of the tourism industry is rather irresponsible. The risk of places becoming commoditised tourism products, while ignoring heterogeneity, complexity and multidimensionality, is too high”. Adriana Campelo (Brazil), Aparna Sharma (India), Ben Knapp (Austria), Buck Song Koh (Singapore), Caio Esteves (Brazil), Cecilia Pasquinelli (Italy), Chris Fair (USA), Christopher Hire (Australia), Ed Burghard (USA), Gary Warnaby (UK), Gordon Innes (USA), Gregory Pomerantsev (Latvia), Gunter Soydanbay (Canada), Gustavo Koniszczer (Argentina), Heather Skinner (Greece), Hjortur Smarason (Denmark), Irina Shafranskaya (Russia), Jaume Marin (Spain), Jeannette Hanna (Canada), Jeff Finkle (USA), Jeremy Tamanini (USA), Joao Freire (Portugal), Jordi de San Eugenio Vela (Spain), Jose Fernandez Cavia (Spain), Jose Pablo Arango Calle (Colombia), Juan Carlos Belloso (Spain), Magdalena Florek (Poland), Manolis Psarros (Greece), Martin Boisen (Netherlands), Mihalis Kavaratzis (UK), Mike Fabricius (South Africa), Oliver Zoellner (Germany), Paul Temporal (UK), Raquel Goulart Sztejnberg (Netherlands), Robert Govers (Belgium), Sebastian Zenker (Denmark), Sonya Hanna (UK), Statia Elliot (Canada), Todd Mayfield (USA), Tom Buncle (UK). More about our panel here. Enjoyed this snapshot of expert views on how overtourism affects the reputation and competitiveness of destinations, and how place branding can help to solve the issue? Spread the word!